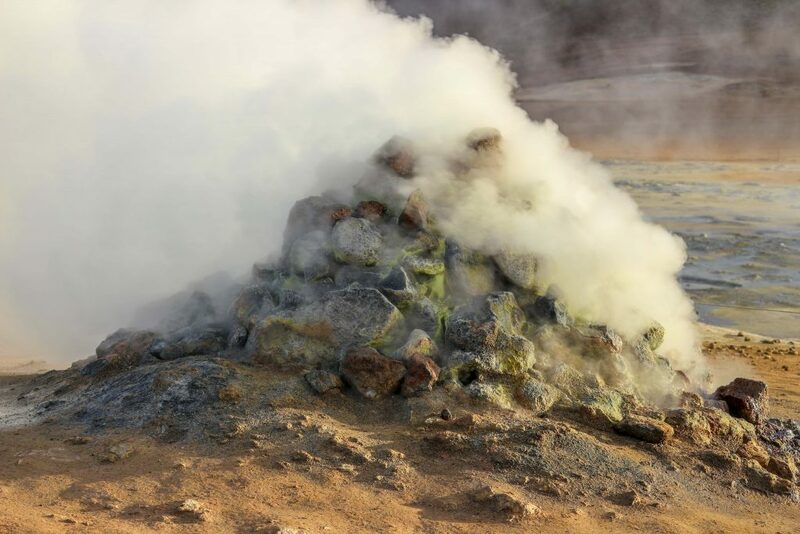 One thousand rotting eggs – that’s what Námafjall Hverir smells like. The smell seeps into the car with the windows still up, whilst we’re still about half a kilometre away. Námafjall Hverir is a hotspot of geothermal activity, and its smell comes from hydrogen sulfide gas that’s constantly being released from its hot springs and steam craters. Beside the smell, this isn’t somewhere you’d want to take a dip – the muddy water is boiling hot and acidic, and the larger vents are ringed off for safety. The area is so sulfur-rich that it used to be mined for use in gun powder. In fact, many of the steam springs are actually drilling holes that have now been covered over with rocks. The conditions here are so unfriendly that no visible life grows. Instead it’s the angry earth that’s on display, bubbling and steaming, and throwing up coloured elements and sulfur-rich minerals that streak the ground blue, black, green and yellow. A reminder that under its deceptively calm surface, the earth is constantly churning. Some steam craters look just like pressure cookers, ready to explode. The simmering mud pools resemble witches’ cauldrons. It’s all totally otherworldly, and NASA thinks so as well. They’ve been sending astronauts to the area as part of their training since the 1960s. Neil Armstrong trained here before stepping on the moon, and NASA continues to fly out astronauts and scientists in preparation for Mars exploration. So if you can’t afford a SpaceX ticket but have always dreamed of space exploration, you should definitely pencil Namafjall Hverir and the general Mývatn area into your bucket list. There is a marked walking path around Námafjall Hverir for safety – areas near the springs can be boiling hot and unstable. It’s an easy, out-of-this-world walk that’s well worth the overpowering stinkiness. Just try not to breathe through your nose too much and be prepared to have to air out your clothes afterwards. Námafjall Hverir is a short distance from lake Mývatn which is a great base for visiting the area. The area has a few hotels, mapped above – I stayed at Sel Hotel Myvatn and can thoroughly recommend it. Keep in mind that the hot water in all hotels in this region is also sulfurous, so you won’t be able to escape being reminded of the smell of Hverir – though the stench level is similar to half a rotten egg, rather than a thousand. Mývatn literally translates to ‘midge lake’, so take midge protection when visiting this area. Suffice to say it is very appropriately named, and there were clouds of midges hanging about in May. Námafjall Hverir is easy to reach by car as it’s just off Iceland’s main ring road and forms part of Iceland’s Diamond Circle. Don’t miss Dettifoss that’s a short drive away. For more of my travel around Iceland and related tips, click here .